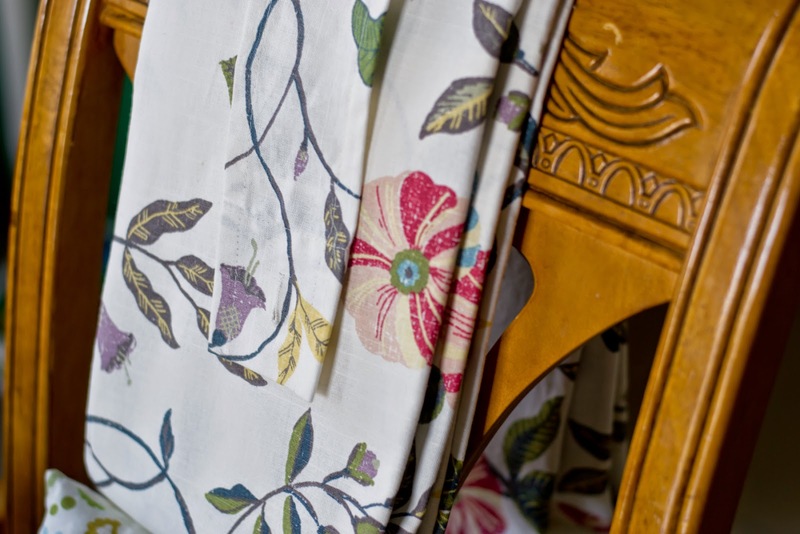 So with a baby on the way, I have finally gotten into gear on wanting to fix my home up... after almost two years of living here. 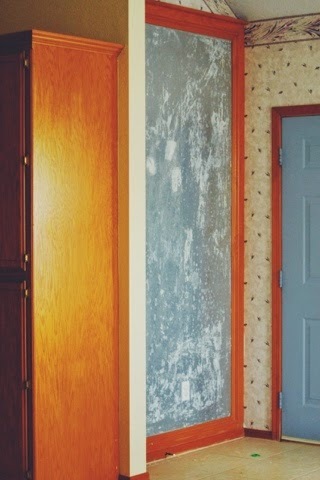 I love my house but it does have a few dated finishes, like wallpaper and mauve countertops. My husband and I had been discussing starting to work on things for awhile and we just finally got into gear. We decided to work one room at a time, fix the dated finishes and work on furnishing or decorating it before moving onto the next. While I would love to start on my kitchen, it needs the countertops redone and that's going to take a lot of work. So we went with the next room, the dining room and her beautiful wallpaper from 1991. I didn't take a photo BEFORE because, I was busy peeling wallpaper down. But you can catch a glimpse of it in this older photo. That was when I discovered I had a magnet wall that had been wallpapered over. It's still there, just like that, but all that pretty wallpaper is gone, heh. And this is how it looks now, without any decorations at this time. It's called "done for now" and until I have time to get the rest, it will stay as is. 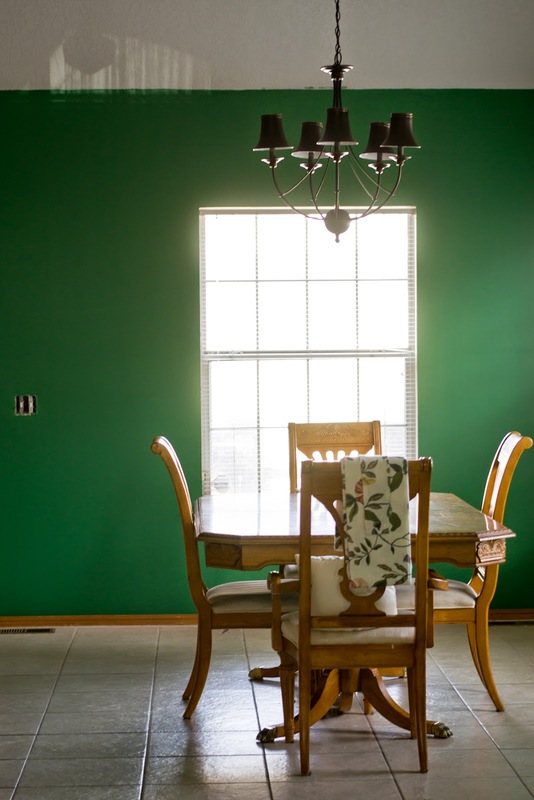 I decided to go with a bold green, my kitchen will be turned white and bright when the time comes in the spring and the living room plans are all moving neutral with touches of black and white. 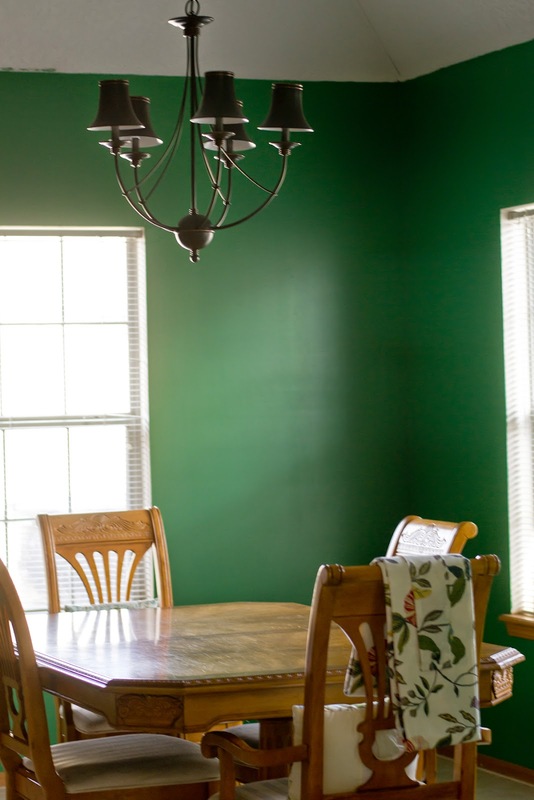 So I wanted to be BOLD in one room, the dining room is the perfect place for that. I knew I wanted to go green, I had messed with darker greens and softer greens before deciding on this one. 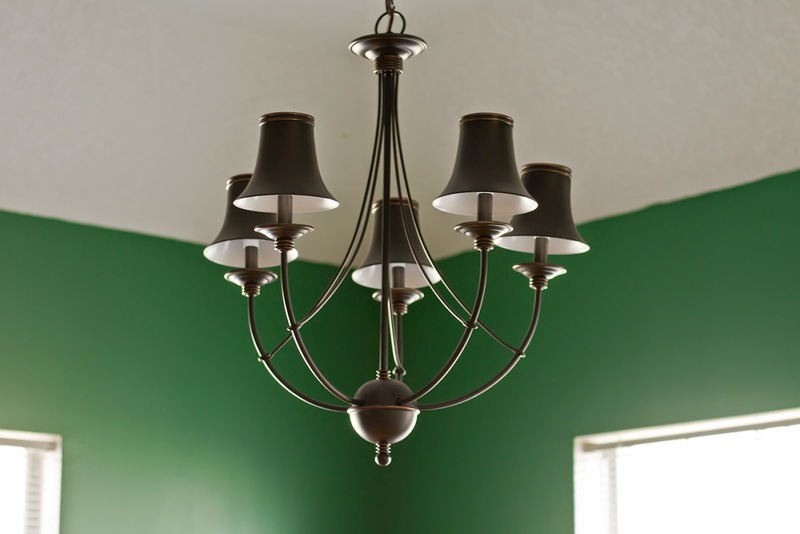 It's called Chesterfield French Green by Valspar from Lowe's. I picked it up, showed my husband and we gave it a few weeks before we decided to stick to it and put it on our walls. I'm in love with it! I know some people think it's a big dark, but it's the only room with a color like this. I have a lot of beautiful glassware my Grandma gave me recently in glass, white porcelains and a very beautiful rose colored depression glass tray that will be going in here when I pick up my shelving. I had originally wanted to paint all the trim white as well, I love white trim. But the whole house is done in the same oak trim and I didn't feel like sanding and painting a whole houses worth of trim. 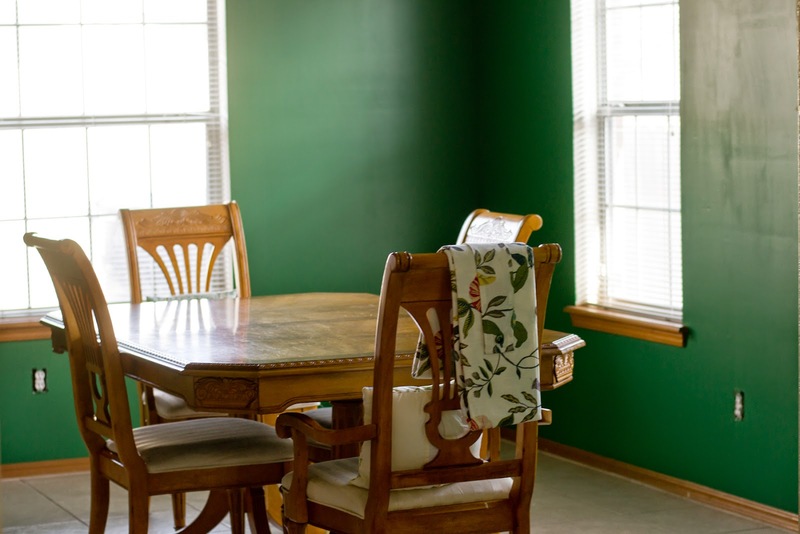 I love the wood color with the green and with all the decorating I plan to do with white, I think having the wood trim will keep it from being too much of the same. I'll be recovering all the seats with this table cloth I picked up on clearance at Target. While I do want a more updated, modern vibe, I went with something a little more traditional to compliment the table we have right now. When I can build the table I want, I'll change my finishes. We also replaced the old gold and brown fan with a chandelier, thanks to my parents. With this being our first big project in the house, they wanted to buy something to put in the room. I couldn't be more thankful and I was happy to find something I wanted. Granted, I want to take those hats off... but my husband insisted we put them on. Someday, when I'm not pregnant and can climb the ladder, they may disappear. My ideas do seem to be heading in a "french" way, so I might start seeing what else I like that's "french" looking without going overboard. And that's it for now, I have a list of things to do for this room to be completed over time. Cute table settings/decorations so my table isn't so naked! It's not on the list, but eventually we want a different table and chairs. For now, we're just slowly filling in the gaps a small budget will allow and we'll hit the bigger ticket items another time. Oh, we also just need to put the covers back on all of the receptacles, if you didn't notice the sad looking light switch over there. Hopefully I'll have some more progress to share in the next month!